Neatorama does its duty in pointing to something truly 'neat'. 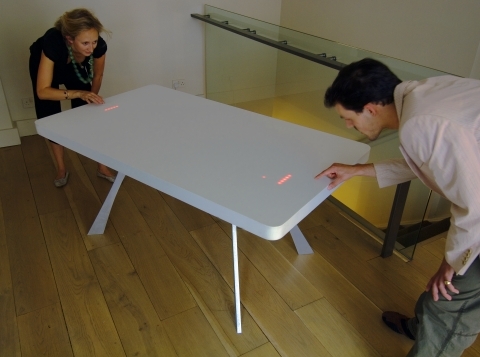 An interactive gaming table combines arcadia with a tangible tablet. Like a Wii for Pong (or perhaps Ping Pong for Wii), the Pong Table uses embedded LED lights along with touchpads to create the experience. When turned off, the 2500 LEDs are unnoticeable, leaving the table ready for dinner. In addition to the Pong Table, Moritz Waldemeyer created the Roulette Table for gamers who gamble, as well as the Corian Mirror which reflects a pixelated image of the onlooker in real time with 1000 LEDs.